Under the changes, introduced when Chris Grayling was justice secretary, firms were given contracts to supervise low and medium-risk offenders. 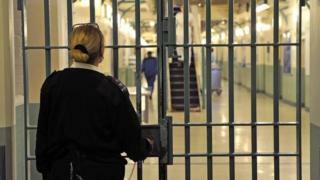 The National Audit Office says reforms were “rushed” and warns more people are being returned to jail for reoffending. The government said it took the findings “very seriously”. BBC home affairs correspondent Danny Shaw said it was a “scathing report which raises the most serious questions about decision-making at the Ministry of Justice”. The NAO said the MoJ “set itself up to fail” after it used a payment-by-results model which was “inappropriate” for probation services. In 2013 the MoJ began a major reform of probation services, partially privatising it in England and Wales. It saw 21 companies – known as community rehabilitation companies (CRCs) – extend monitoring for those who had served short jail terms. But the report says the MoJ “designed and implemented its reforms too quickly”. By March 2018, the CRCs faced loses of £294 million over the lifetime of the contract – compared with the initially expected profits of £269 million. Four months later, Justice Secretary David Gauke acknowledged that the quality of probation services being delivered was not good enough and announced the MoJ would end the contracts with the CRCs in 2020 – 14 months early. The report estimates that additional payments to CRCs beyond the original terms of the contracts will cost the department £296m, and terminating the contracts early will cost at least £171m. The full cost to the taxpayer will not be known until at least December 2020, the report says. It concludes that the MoJ’s contracts were “ineffective” and “hampering its ability to hold providers to account for poor services”. Overall, it noted “little progress has been made on transforming probation services”. Rory Stewart, prisons and probation minister, said the performance of CRCs was “too often deeply disappointing”. “That is why we have stepped in to end contracts early and invested an extra £22m a year in services for offenders on release,” he said. The NAO report also said the number of people returning to prison for breaching their licence conditions after serving short sentences had “skyrocketed” – costing the taxpayer even more money. Meg Hillier, who chairs the Commons Public Accounts Committee which scrutinises the value for money of public spending, said the MoJ’s “botched contracting has left this essential service underfunded”. “The ministry now needs to reflect and ensure that its new proposals can deliver the much needed improvements to probation services,” she added.